President Donald Trump's State of the Union address was just under an hour and a half in its entirety, but there were several key lines that were memorable because of the vivid or telling reactions they prompted in the House Chamber. Some touched on pivotal issues that have been at the heart of the administration's policy priorities, like building a wall at the southern border and working towards a better relationship with North Korea. 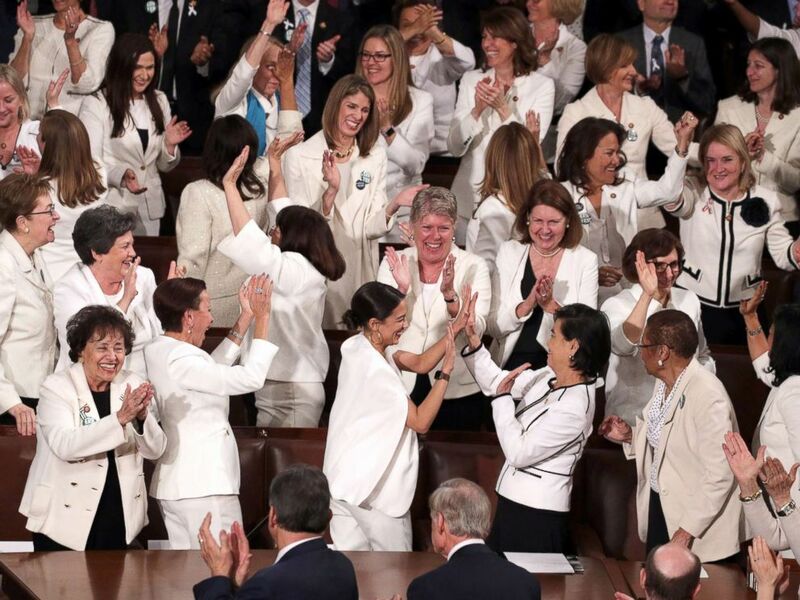 Others were more spontaneous, such as when the largely quiet Democratic female members of Congress -- many of whom dressed in white to send a political message -- took a moment to celebrate their wins in the midterm election. "Now, Matthew is the very first person to be released from prison under the First Step Act." "No one has benefited more from our thriving economy than women, who have filled 58 percent of the newly created jobs last year. You weren’t supposed to do that. Thank you very much. Thank you very much." "All Americans can be proud that we have more women in the workforce than ever before -- Don’t sit yet. You’re gonna like this! And exactly one century after Congress passed the constitutional amendment giving women the right to vote, we also have more women serving in Congress than ever before. That's great, really great. And congratulations, that's great." "These are living, feeling, beautiful, babies who will never get the chance to share their love and dreams with the world. And then, we had the case of the governor of Virginia where he stated he would execute a baby after birth. To defend the dignity of every person, I am asking Congress to pass legislation to prohibit the late-term abortion of children who can feel pain in the mother's womb." Trump was referencing embattled Virginia Gov. Ralph Northam's controversial comments about third trimester abortions. During a radio interview with radio station WTOP, Northam said "it's done in cases where there may be severe deformities, there may be a fetus that's non-viable. So in this particular example, if a mother is in labor, I can tell you exactly what would happen. The infant would be delivered. The infant would be kept comfortable. The infant would be resuscitated if that's what the mother and the family desired, and then a discussion would ensue between the physicians and the mother." ABC News' Justin Fishel, Mariam Khan and Kendall Heath contributed to this report.